Metals always have an adverse reaction when they come into contact with moisture and air. The problems of corrosion are extremely common and even alloys like steel aren’t safe from it entirely. Corrosion is extremely harmful to certain aspects of the metal’s properties, such as strength, and for that very reason, it is extremely important to ensure that any and all steel used for any purpose is completely rust-free. However, before we can do that, we need to understand exactly why does steel rust and how we can prevent it. The word “corrosion” means the gradual destruction of materials, especially metals like steel, due to exposure to oxygen and water. Depending on the kind of alloy you are talking about, corrosion can differ. For most alloys, exposure to moisture-filled air is enough to begin the corrosion process. However, metals can also have a different reaction if they are exposed to certain substances. Basically, for corrosion to occur at a certain pace, there is need for oxygen and water to come into contact with the metal. For steel, this process is no different! Steel is one of the most popular metals used around the world but the rate of corrosion makes it one of the most popular choices for us. Steel has a relatively lower rate of corrosion however, all it takes is exposure of bare steel to moist air. The air contains oxygen which is basically the oxidant required to carry out the process of oxidation or to bring about a change in the oxidation state of steel. Depending on how strongly bound are a metal’s ionic structure, the metal may be more or less susceptible to rusting. Corrosion mainly occurs on those metals that, like steel, favour the process. Gold and Platinum, no matter how exposed to moist air, will never corrode because the parts that corrode tend to lead to the formation of purer versions of those metals. Steel, on the other hand, is unlike that and needs protection. 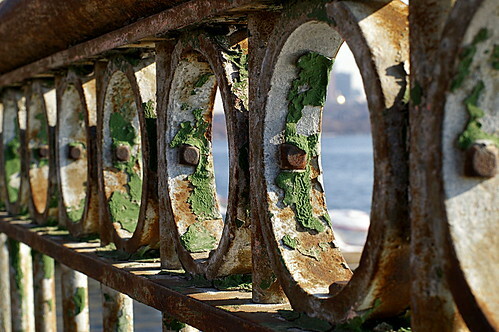 There are several different means and ways of controlling corrosion in steel and even preventing it altogether. None of these processes is meant to last a life-time so there is always a need for replenishment after regular intervals. In most cases, the addition of a few elements can improve the anti-rust properties of steel. For e.g. carbon is a great element that lowers the rate of steel-corrosion by almost half! Cathodic protection is the process by which copper, phosphorus, Chromium and nickel are added to steel to improve its resistance to moist air. This kind of addition has been, at times, considered good enough to be used on its own, without any protective coating on top. Hot rolling and forging a steel surface is also a great way of introducing millscale onto the surface of the steel, which also helps in reducing the effects of the rusting process. Adding a layer of protective film is usually considered as the most effective technique of keeping the steel safe. A thin film of coating is added after cleaning the steel under high-pressure water or some form of abrasive liquid that can completely clean out the surface. Anything that can, possibly, corrode the steel is removed to ensure that there isn’t any corrosion under the protective layer. Chloride is one of the most harmful elements that can hurt steel and making sure that there aren’t any traces of chloride on the surface is vital. The protective coating is, then, applied to the surface of the steel. There are many different types of coatings and all have just one thing in common – they are all extremely toxic and need special skill and protective clothing to ensure that there are no accidents during the application process. Finally, the steel is kept away from moisture until the coating dries. Thereafter, it is brought into use in places such as building construction, chassis construction and almost any or every other place that requires a strong metal that can withstand extreme conditions without breaking, getting damaged or corroding. When George decided to leave the metal industry to take on a job as a consultant, he was entering a world he knew nothing about. Having worked in mills, mines and stores in some of the biggest organizations in the world, like Midway Metals, George gained invaluable knowledge that he chose to spread to others around the industry. His seminars are extremely popular, especially when he’s talking about his favourite metal – steel! George recently conducted a series of bottom-line training sessions, speaking on “Why does steel rust and how can we prevent it”.